Homemade applesauce and apple butter are wonderful treats for any age, and my boys particularly love them. I grew up enjoying my grandparent’s homemade apple butter, which they faithfully canned for many years. They are both gone now, and I never did get the recipe from them, but I keep hoping that a relative will suddenly announce that they’ve found the long lost family recipe and kindly share it with me. Family heirlooms like that should be preserved (pun intended). This particular recipe is adapted from a new cookbook that I’m reviewing (coming tomorrow), Cooking with Shelburne Farms: Food and Stories from Vermont. The cookbook is rich with recipes from the famous Vermont farm estate, now a national historic site and non-profit environmental education center. The recipe is in two parts, so if you want to just make applesauce, simply stop after Part 1. Both the sauce and the butter start the same way, by tossing apple slices with apple cider, maple syrup, and cinnamon sticks in a large roasting pan, then baking for 30 to 45 minutes. The aroma of the cooking apples is intoxicating, though ultimately for me there wasn’t enough cinnamon flavor in the apple butter base, so I added more cinnamon along with other spices. In addition to refrigerating or freezing, you can also can the apple butter using the boiling water method. Instructions below. The homemade applesauce made me desire to only eat this kind of applesauce for the rest of my life. It is so good. The color comes out rich and golden, not pale like most commercial applesauce. I’ve never had an apple butter or sauce made with maple syrup, and I was delighted with the flavor. The maple-infused apple butter tasted delicious on our homemade biscuits, and I’m tempted to try it on Ina Garten’s Maple Oatmeal Scones. We used a New York maple syrup that Michael’s parents brought to us on their last visit, a Grade A Dark Amber, which has a light flavor. A Grade B syrup will give more flavor, and the book recommends using that grade if you can find it. The recipe calls for star anise, but neither Michael nor I enjoy anise flavor, so we skipped it and opted for other flavors in the apple butter. I made full batches of both applesauce and apple butter because we had plenty of apples from our recent apple-picking excursion to Tarara Winery, but that meant prepping 10 pounds of apples and running all of those cooked apples through the food mill. To speed the prep along, I skipped peeling the apples per the recipe and just cleaned them well and used an apple slicer which cored and divided the apples all in one stroke. That helped a lot on the front end prep. Then before putting the cooked apples into the food mill, I quickly took a potato masher through them, which helped make the texture easier for the food mill to handle. Remember, the food mill is not only for grinding the apples but also separating the peels from the flesh, so taking a minute to mash them up a bit beforehand will likely save you some time later. If you don’t want to bother with the food mill, then you need to peel the apples before roasting, but then you can use a food processor for mashing at the end. Either way, if you’ve got an extra pair of hands nearby, then ask for help and bribe with homemade applesauce and apple butter! Adapted from Cooking with Shelburne Farms: Food and Stories from Vermont, by Melissa Pasanen with Rick Gencarelli. 1. PART 1 – Preheat the oven to 350° F/175° C.
2. In the large roasting pan, toss the apples with the cider and maple syrup, then lay the cinnamon sticks around in the apples. Roast until the apples are very soft and mash easily, 30 to 45 minutes. 3. Remove the cinnamon sticks. If you left the peels on, mash the apples slightly with a potato masher, then run them through the food mill. Use the fine blade for apple butter and the coarse blade for apple sauce. If you peeled the apples before roasting, then process the cooked apples in a food processor. Applesauce is finished, just set aside to cool, then put into containers and refrigerate or freeze. You can also keep a cup or two of applesauce and turn the rest of the mixture into apple butter, just make sure that the mixture is finely ground so that you get that nice, smooth texture for which apple butter is famous. 4. PART 2 – Reduce oven temperature to 300° F/150° C. Stir the milled apples with any remaining liquid from the roasting pan and the ground cinnamon, cloves, and allspice. Add more maple syrup if desired. 5. Spread the mixture into the roasting pan, making sure to spread evenly throughout the pan. Cook in the oven for 1 to 1-1/2 hours, depending on how much you started with. Stir every 30 minutes, working the edges into the middle. Test for doneness by dropping a spoonful onto a plate. If no liquid is released, then the apple butter is ready. 6. Remove from oven and allow to cool completely. Spoon into containers and refrigerate or freeze. 7. CANNING – To can the apple butter, prepare the jars according the directions for boiling water canning. Skip step 6 above (cooling) and add the hot apple butter to the hot jars, leaving 1/4-inch (0.5 cm) head space. Remove the air bubbles and adjust the air space by adding more butter if necessary. Make sure head space is precisely 1/4-inch (0.5 cm), or the jars will not seal properly. Wipe the rim clean and center the lid on the jar. Screw the band on just until finger tight. Do not over tighten. Process jars according to the boiling water canning directions for 10 minutes with the lid on. Remove the canner lid and wait 5 more minutes, then remove the jars. Allow them to cool completely, then store in a dark location for up to one year. Both applesauce and apple butter will keep in the refrigerator for up to 2 weeks, or several months in the freezer. For freezing, I like the Ball® Plastic (8 ounce/16 ounce) Freezer Jars. They are just the right size and they stack easily. Other fruits to try with apples: pears, plums, apricots, peaches, cranberries. Andrea that looks yum. Funny, I’m not sokeen on cinnamon and love anise, and as you were writing I added cinnamon I was just thinking I would cook it with Star Anise. Then I got to the rest of your text. You know a recipe is good when you start adapting it for yourself before you have even finished reading it. It is apples for England in the orchards here at the moment so we generally get a whole wheelbarrow full and get chopping then make apple juice with a big handpress. 2 -3 people make the work go a lot quicker and then we share out the juice. I grate a little fresh ginger in mine which gives it a delicious kick. Inge, the ginger in your fresh apple juice sounds delicious! How timely! I have a friend who has been asking me for a month to make apple butter! Thanks. That sounds soooo good. I have a few apple trees in my backyard and always make up applesauce. Last year was the first time I made apple butter, but I will definitely be doing it again and the addition of maple syrup sounds fantastic! I love that you use maple syrup! This sounds fantastic! Oven-roasted apples? OH MY. I’m off to the kitchen! BTW at least to my palate, apples are often sweet enough by themselves that there’s no need to add more sweetener. And if you DO put cooked apples into the food processor, the skins disappear and you’ve kept all the flavor and fiber. Just discovered you by accident, love this post. It’s a fantastic recipe I can’t wait to try! The commercial apple sauce looks like baby food, this one has a beautiful color and it looks fabulous! How handy is this? 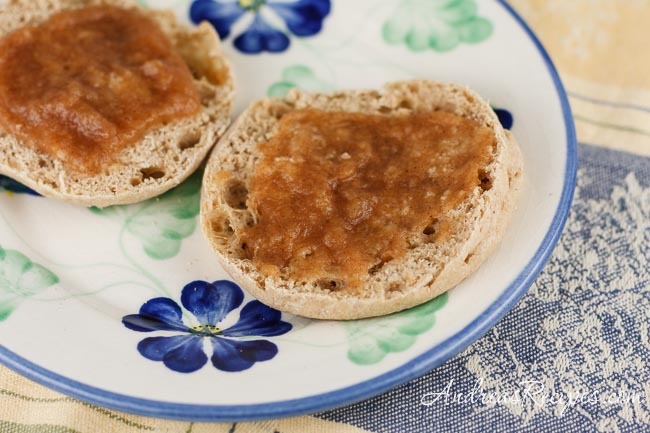 I’ve been thinking about apple butter recently (still have quite a few apples from my recent apple picking adventure)…. I really like the idea of roasting the apples! (I’ve always cooked them on top of the stove.) And I like the idea of leaving the peel on too. It must add colour. Also, good idea to use maple syrup instead of sugar. This is great recipe and so wonderful that you can pass this on to your boys, even if it’s not exactly the same as your grandparents. 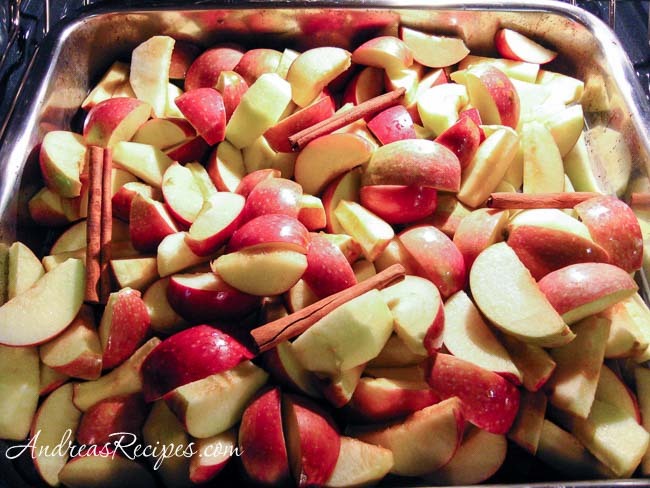 I love the picture of the apples and cinnamon sticks in the pan, it’s beautiful! I ike your apple sauce recipe. I have a problem keeping my baked pie/tart pastry fresh. Each time I baked a pie/tart with pineapple filling wrap in it, I would keep it in a tight container, after a day or 2 it softened a little, does not taste as it originally comes out from oven. By the way, i live in asia. I have been seaching for an answer for years and hope you can help me. Thanks a ton!! My grandfather made the best applebutter in a very large black kettle. I loved watching him making it and it was difficult waiting for it to be done. My mouth was watering from the smell alone. It was a dark applebutter and I have only found it one place that is near it–Cracker Barrel. I definitely will try yours and experiment with the spices.